Ed Note : This article was written when Nanaji was alive and therefore the article is in present tense. Chitrakoot is famous for its significant role in the exile of Sri Rama. It was in these forests of Chitrakoot that Sri Rama spent a large time of his exile. This made Chitrakoot a place of devotion and faith for Hindus worldwide. However in recent years, apart from its religious significance, life for the villagers in this holy place gradually lost relevance with the teachings of Sri Rama. The dense forests disappeared with time, agriculture lost its profitability and governance was limited to tax collections and VIP visits. Poverty grew with increasing unemployment and water shortage ruined agriculture. Bandits controlled the area and spirituality shrunk to religious shrines and temples. By the early seventies, Chitrakoot became a dry and poverty-struck area with temples and shrines as the only source of income. It was in 1969 that Nanaji Deshmukh visited Chitrakoot. 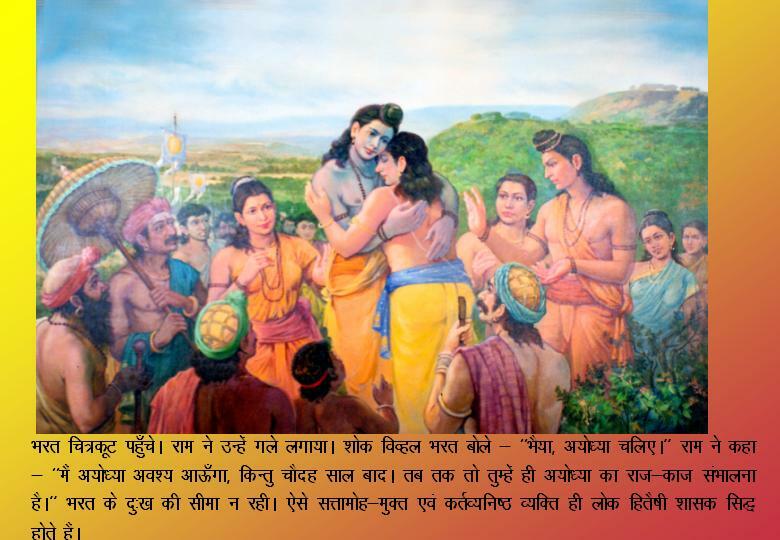 He was moved to see the pathetic condition of the society in the karmabhoomi of Sri Rama. He sat by the holy river Mandakini, and resolved to change the picture of Chitrakoot. Nanaji gave up an illustrious political carrier, politely refusing a ministerial birth offered by the then Prime Minister Morarji Desai and announced his retirement from active politics. He returned to Chitrakoot to lay down the foundation of Deendayal Research Institute now famous as DRI. 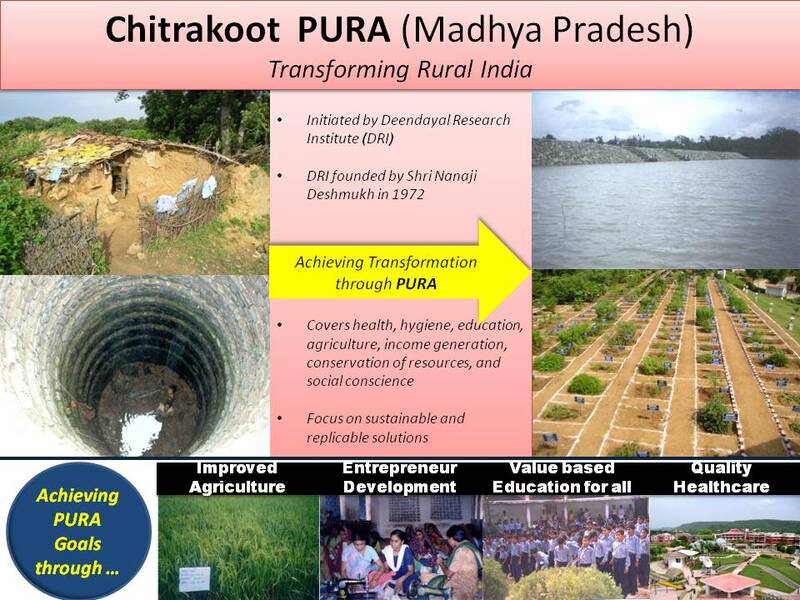 Named after the famous thinker and organiser Deendayal Upadhyaya and designed to implement development programmes through his vision of ‘Integral Humansim’, DRI was aimed at rural development and research, targeting villages around Chitrakoot. Nanaji laid down the objectives of DRI, aiming at complete independence of villages and villagers in agriculture, water resources, health, moral character, education and employment. His vision was to design a system of development based on local knowledge and technology and enhancing the same for the prosperity of the locals rather than invite external investments. The challenges were massive and the primary challenge was to win over the trust of the villagers in order to prepare them for the change. Work started with minimum resources and maximum efforts. The primary focus was on making agriculture a profitable venture as Nanaji believed that only prosperity can make a happy society. A meeting of farmers from 19 villages was called and a decision to create local dams to sustain rainwater was taken. Men, women and children contributed to the call and before the rains could arrive, dams had come up in every possible location. Interestingly, no cement, concrete or iron was used for the purpose and only local stones and mud was used. Many ‘leaders’ laughed at the idea and said that these dams will not even stand the first rains. But they did, and are strongly standing till date. The experiment has recharged the entire ground water system around Chitrakoot and even in the months of May and June, local wells carry 10-15 feet of water. Nanaji went further to launch Krishi Vikas Kendras (KVKs) resource and research centres aimed at transforming unprofitable landholdings of poor farmers into profitable ones. The KVKs helped the poor farmers harvest rainwater, use latest methods of agriculture and provided knowledge and resources for the same. They also created Seed Villages in a cluster of villages and Seed Clubs at village levels where farmers could get better seeds for better yields in their own villages, rather than awaiting government machinery to supply them. These villages are now not only meeting the seeds requirements of their own village but also supplying the surplus seeds to nearby villages that provide good income to the growers. The members of the Seed Clubs exchange their seeds for food grains within the village (for1 kg seed they take 1.25 kg food grain from farmers). Nanaji’s focus on education was clear since the time he established the first Saraswati Shishu Mandir in Gorakhpur in his days as a Pracharak. In Chitrakoot, he has ensured that not only do the students get good education to earn a happy living, the same education evolves them as responsible citizens and integral components of a happy human race and not just money making machines that work under the pressure of a mad market frenzy. The pre-primary education begins at Nanhi Duniya or the ‘little world’ where children in the age of 3 to 5 years come not to study, but to experience nature. They play with everything from colours, balloons to geographic models, maps and toys, and learn by interaction rather than reading and writing. Nanhi Duniya is an interactive world that teaches important lessons of the world to toddlers while playing with nature. It has interactive and play-based models and galleries on themes of geography, history, zoology, sports and yoga, swimming, words and numbers, and art and creativity. Primary education in Chitrakoot begins at Surendra Pal Vidyalaya where the children study standard curriculum. The hostel accommodations here are designed as family units. Ten students stay in a flat as a family, with their responsibility assigned to an aged couple called Guru Mata-Pita who ensure that the children get a family atmosphere and do not feel isolated in a big world. They are also responsible for inculcating cultural and moral values in these children. Each family is provided with a cook. For post secondary education, Nanaji founded the first rural university in India, the Mahatma Gandhi Chitrakoot Gramodaya Vishwavidyalaya. This university has state-of-the-art courses and equipments, including a fully equipped Geographical Information System Lab in its Geology department. Nanaji believed that only a healthy society can be prosperous. Thus came into existence the Aarogya Dhaam, a world class comprehensive health care and research centre that focuses on serving through naturopathy, yoga, and Ayurveda. The many components of Aarogya Dhaam include the Aayurveda Sadan (meant for Ayurvedic treatments and research), The Nidan Sadan (Out Patients Department), The Yoga Sadan (for yogic cure and training), the Ras Shala (where locally grown herbs are used for preparing ayuvedic medicines), Swasthya Kutir (health cottages that offer five star facilities with programmes for healthy physical, mental and emotional recovery), Matri Sadan (maternity and paediatric unit), Swasthya Sadan (In Patients Department), a fully furnished dental unit, Aahar Vihar Sadan (canteen), a spawning herbal garden spreading many acres, and a large library and documentation centre. Located on the hills of Chitrakoot surrounded by forests and overlooking the holy Kamtanathji mountain, this health centre with its lush green lawns, gushing waterfalls and picturesque surroundings are a feast to the eye. It is clearly aimed at handing over a suffering body to mother nature, mentally, emotionally, spiritually and physically, helping it with the very components derived from nature in the form of herbal medicines and cure, thereby bringing a comprehensive recovery of the entire human system that heals the mind, body, heart and soul, permanently. The DRI has also developed and designed a pack of 34 local herbal medicines that are derived from local knowledge and have been found to be very effective in curing frequently occurring ailments and diseases. They call it Dadi Maa Ka Batua. This kit has gained tremendous popularity in the villages and has helped save the villagers from expensive treatment and medicines. Adjacent to the Aarogya Dhaam is a well-maintained and well-equipped Gau Shaala where cows of different Indian breeds are kept and conservation of superior genetic germ plasm and their propagation for milk production and agricultural needs is done, specially for breeds which are in danger of extinction. The Gau Shaala is also engaged in maintaining pure Indian breeds through artificial insemination of cows and bullocks for better and quality milk production in order to make the Indian cow an economically feasible, useful and profitable option. 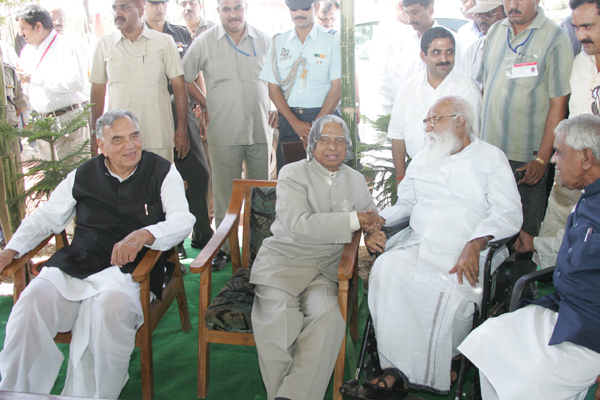 Nanaji’s commitment to Chitrakoot further extends to its people in addressing their employment needs. His vision of providing local options of livelihood with minimum investment and maximum profits resulted in the institutionalisation of Udyamita Vidyapeeth, an entrepreneurship development and research centre that works round the clock for developing, training, and establishing low cost and high income enterprises in the rural areas with the help of self-help groups and individuals. At present this industrial training centre is providing training on fruits and vegetable processing, dal poha and lai production, oil expeller units, readymade garments, screen and offset printing, MCR tiles, sakar blocks, processing of cereals and pulses industry (PCPI), flour mills, cane and bamboo craft, fabrication, computer training, bakery products, soap and detergent production, hand made paper making, and radio electronics. Rural youth from all over the region come here and get trained in the areas of their individual interest. Training is provided in state-of-the-art class rooms and laboratories that help them understand every aspect of their future livelihood. They then go to their respective villages and establish the ventures giving employment to themselves and many others. The focus in designing all industrial solutions is keeping them a low investment enterprise based on local raw materials in order to ensure sustained supplies and profits. A prosperous society is incomplete without its moral and cultural values. DRI has set-up Ram Darshan, a unique interpretation centre of the Ramayana, based on the life and teachings of Sri Rama. Through its unmatched paintings, sculptures, collections and crafts, Ram Darshan not only looks deeper into the meaning of Ramayana, it helps one understand the universal acceptability of his teachings and their relevance in today’s life and society. It is a mirror that tells us where we went wrong, and how the course can be corrected. It is a bridge that connects the islands of religion, knowledge, karma and spirituality for the supreme benefit of a glorious society. In order to ensure that his good work is sustainable, Nanaji, introduced Samaj Shilpi Dampattis, newly wed graduate couples who have a commitment for community service, that live in the villages and look after the work of DRI in a cluster of five villages. The couples are responsible for overall implementation of the DRI programmes. It is in Chitrakoot that Nanaji has shown the world that religion is meant more for the benefit of society than individuals. He has proved that pilgrimages like Chitrakoot should not just be places of worship, but also icons of development and self reliance. He has shown that ideals of Integral Humanism as propagated by thinkers like Pandit Deendayal Upadhayaya, can be made a living reality. Gandhiji’s dream of Gram Swaraj has finally been brought true, not by a congressman, but by a swayamsewak. Last but not the least, Nanajii has shown this generation what is meant by the life of a sage spent in penance. This entry was posted in Nation, Seva, Social Issues and tagged BJP, chitrakut, Deendayal Research Institute, Hindutva, Jan Sangh, nanaji deshmukh, RSS, Village development on September 29, 2009 by arisebharat.